I have another simple summer berry galette for you today! This time it’s singing glory to sweet raspberries and pure vanilla. 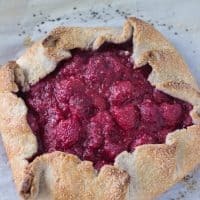 This raspberry vanilla bean galette is sweet, juicy and bursting with rich flavors and I know you will love it! We are all pie lovers around here right?? I feel like I’ve been on a pie trail this summer. Well, a pie and fruity lemonade trail if I am being honest. I’ve been craving every kind of summer pie and realizing that I haven’t baked a lot of fruity pies around here. Besides this epic blueberry pie last summer, most of my pies are fall-ish in nature (apple, butterscotch, pumpkin and the likes). 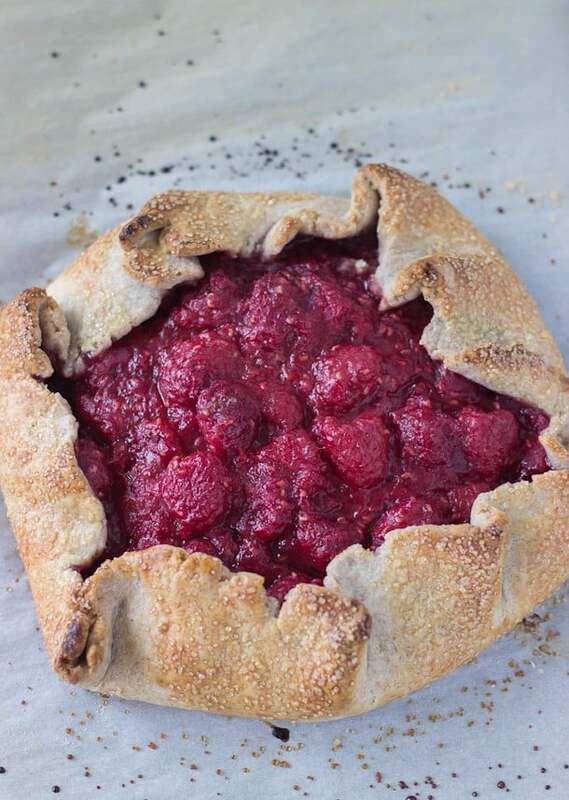 So this summer I am making the effort to make (and eat) lots of summer fruit pies; mixed berry pie, strawberry rhubarb crumble, Cherry Pie and now this raspberry vanilla bean galette. As always, the galette is much easier and quicker to whip up and it has all what a regular pie will boast of. Super flaky crunchy pie crust (I love me some pie crust!) and a juicy berry filing which here is just raspberries with vanilla beans lacing eat bite. 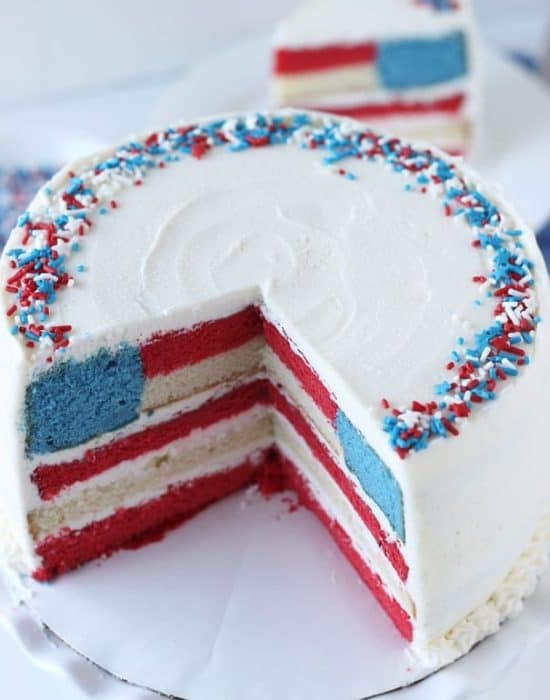 Of course you can always top each slice with a scope of vanilla ice cream to complete the bliss. I hope you get to try this galette this summer before all the juicy berries go out of season again. Combine the flours, sugar and salt in the bowl of a food processor. Pulse to combine. Add in half of the cold butter and pulse 2-3 times to break up butter. Add the remaining of the butter and pulse until just incorporated. In a small bowl, combine the cider vinegar and ice cold water. Drizzle over the mixture, one tablespoon at a time, and pulse until dough starts to come together. If needed, add more ice water, one tablespoon at a time, until dough comes together. Remove dough from bowl and pat down into a disc. Wrap in plastic wrap and chill for at least an hour. In a medium bowl, combine all the ingredients for the filling. Toss together until the flour is incorporated. Let sit for 10-15 minutes as you prepare the crust. When dough is chilled, roll out into a 12-inch circle. (I rolled mine onto a well floured parchment to make transfer easy). Transfer to a baking sheet lined with parchment paper. 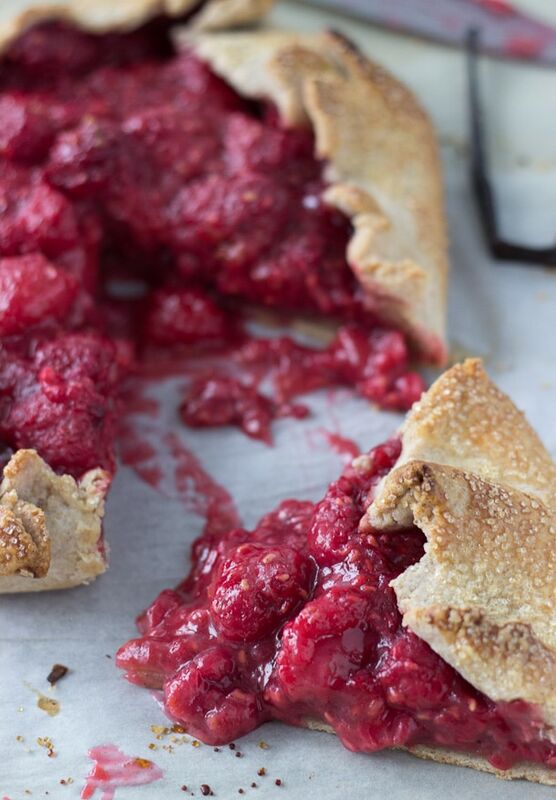 Spoon the raspberry mixture into the center of the crust, leaving 2-3 inch borders. Fold up the sides, gently tucking in over the fruit in a folding/pleating pattern. Brush the dough with egg wash. Sprinkle dough with turbinado sugar. Bake galette for 30-35 minutes until crust is golden and juice from the fruit runs out. 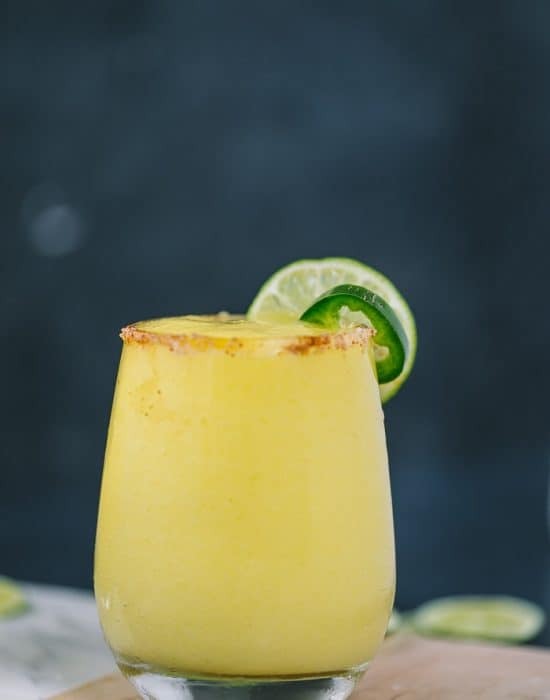 Let cool before serving warm. I miss fresh raspberries! Or at least such galette! So exciting! Can’t wait to hear the news! 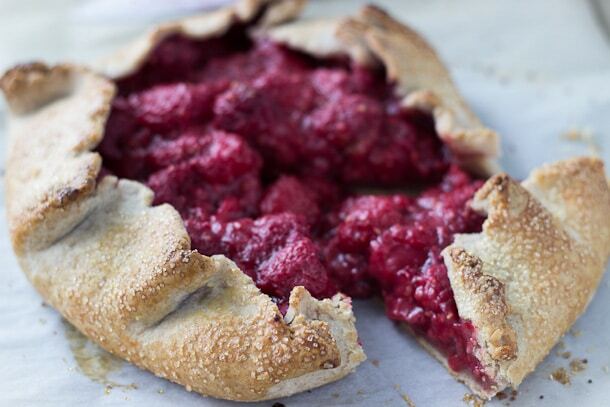 Love this galette — those juicy raspberries are getting to me! I haven’t made a galette is so long and I remember how good the last one was. 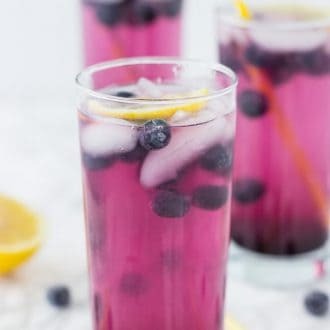 I’ve never thought of raspberry and it looks so good! I love galettes- they are beautiful and easy way to use up any berries left over! I can’t wait to hear the good news once your baby boy arrives. I’ll be thinking about you! Gorgeous galette!!!! and GET SOME REST girl. . Lord knows you are going to need to once baby is here!!! love you, boo!!! Beautiful galette, Zainab. Hooray for vanilla bean and raspberries! This is just delectable. 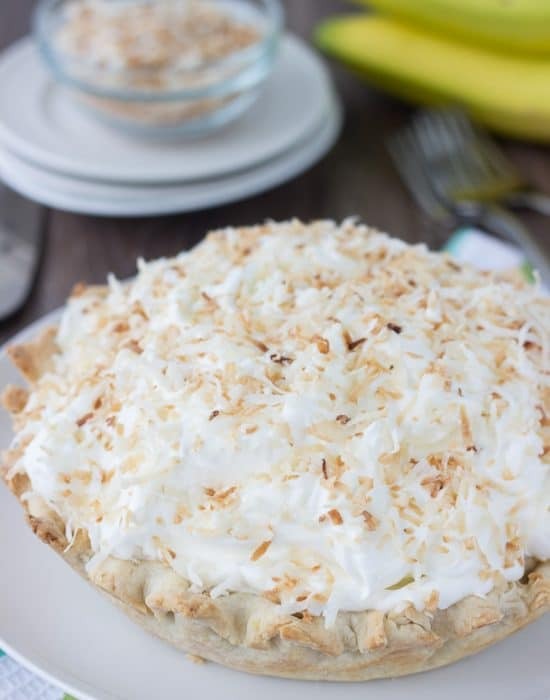 I’ve been making an effort to try and have more pie this summer too and this is right up my alley. Galettes are just so quick and easy and I love the raspberry vanilla combination. I feel like I haven’t had nearly enough raspberry yet this summer. Good luck Z! So excited for you and yes to time off 🙂 Love this galette! It’s gorgeous! I’m in BERRY.MUST.EAT. mode also!! Can’t get enough of all the season’s pies, galettes, crumbles, crisps, cobblers, slumps, buckles, etc. This galette is a beauty. The raspberry color is so vibrant, that you know the flavor must be also. What a beautiful galette! Perfect way to use all the summer berries! 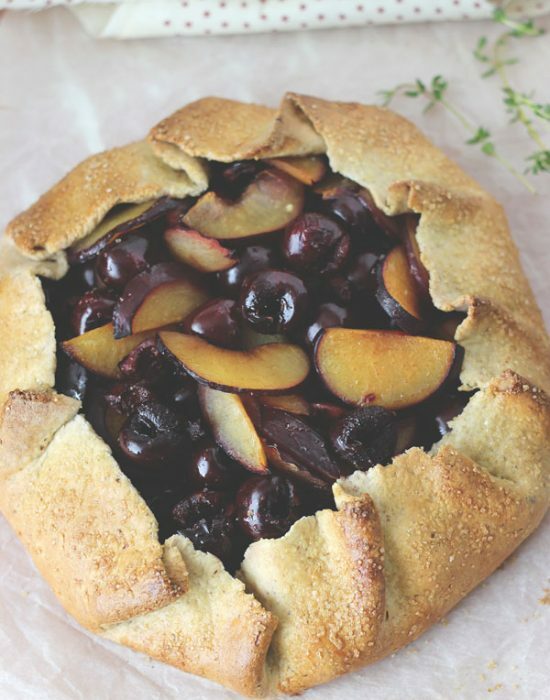 Love the rustic look of this galette. Such a great use of fresh summer berries. And good luck with your delivery! Sending you and baby lots of positive vibes!! I absolutely adore galettes, and this one sounds amazing! I have been craving raspberry pie and now this. I want some now! Simply gorgeous! Oh I love the smell of freshly baked galette…and that pie crust is to die for! Zainab this galette is GORGEOUS! I love raspberries and NEED to make this! I am not very good at pie crusts so galettes are my thing! Hi Zainab, your galette looks amazing, love that it looks so rustic and homemade. Enjoy your little one!!! We are over run with raspberries at the moment so the perfect dessert to use them up in. This is my kind of galette!! I love that you added the vanilla bean and that sugar on the crust! Raspberries and vanilla taste great together. The vanilla does a great job of mellowing out the flavor of the raspberries! 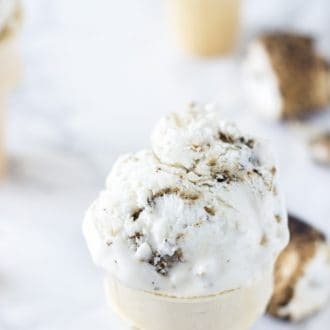 Using vanilla bean instead of vanilla extract also intensifies the flavors.